Cambria, a privately-held company based in Minnesota, is a natural, quartz surfacing which has a variety of uses inside of the home such as countertops, showers, tiles, wet bars, fireplace surrounds and so much more. Known as one of the hardest materials on Earth, the designs, from afar, look just like granite, marble and other related quarried stones, but unlike these materials, Cambria is noted for its strength and durability as it is nonporous, unable to absorb food and liquid like granite does, truly making it maintenance free. 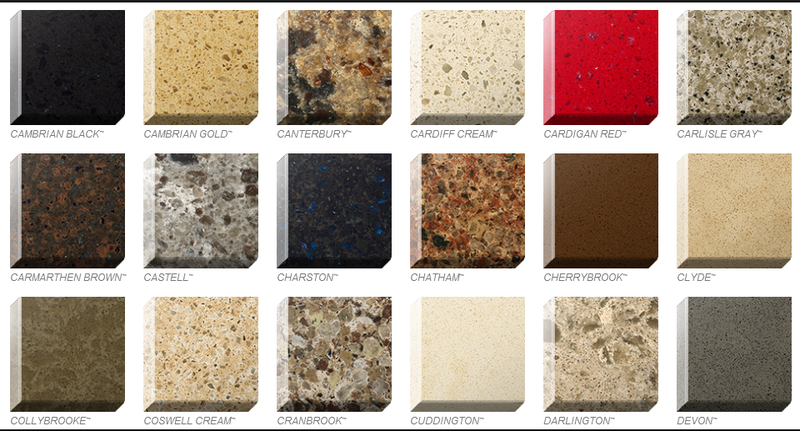 As the only American company today, Cambria offers a wide range of slab sizes, edges, colors and designs to choose from. How much does Cambria quartz cost? The costs of Cambria quartz counters will depend on the retailer/installer you choose, the scope of the job, the contractor you hire, your geographical location and the type of Cambria quartz you wish to purchase. Based on these factors and from the estimates we gathered online, the average cost for both the material and labor seemed to be in the $70 to $125+ per square foot range. These costs can greatly increase, however, if you needed additional cutouts, holes drilled, a thicker counter and/or premium seams, for example. In your hunt for prices, what you’re going to find is that every dealer will have their own “mark up,” making it extremely hard to offer an exact price for your project. Since there are so many factors, as you can see, we highly recommend you use the free quote comparison service, HomeAdvisor.com. With this tool, you can simply explain your job and contractors, based on what you provided, will contact you with a free, no-obligation quote. No credit card is required and the entire process only takes minutes. As we were able to find so many quotes online that people shared, we included our findings in our table below, along with the source of the website where we found the information. The official website, CambriaUSA.com, while they did not specify the prices you will probably pay, they did note in the FAQ that the prices are comparable to granite and other stone surfaces. The company, at the time of this publishing, offers 151+ designs, with some of the most popular searched designs including Torquay, Whitney, Brittanicca, Windermere, and Swanbridge, and various edge profiles to create a truly unique product for your home. To view the designs visually, you can do so by visiting the “design palette” portion of the official website and can view all of the colors via this tool as well. You can also visit a local retailer to inspect the samples in person or even online when paying the shipping and handling fee. Many designs to choose from — Cambria, according to the company, is available in more than 120 designs, with each design boasting a natural beauty and variation of the quarry cut stone. Stronger than most materials — Known for its diamond-like hardness and superior strength, it’s known to be much stronger than granite and other stone related surfaces. Truly maintenance free — It is maintenance-free, meaning you do not need to seal or polish it. All homeowners need to do is wash with a warm water and mild soap if desired. Stain resistant — The material is able to resist stains from common household items such as tea, wine and coffee. Due to the nonporous nature, the maintenance is as simple as can be. Limited lifetime warranty — The company backs its product with a lifetime limited warranty, which you can learn more about here. Safe food preparation area — As the material is nonporous and NSF 51 certified for food, the surface is 100 percent safe for food preparation. Cambria vs. Granite — what’s the difference? 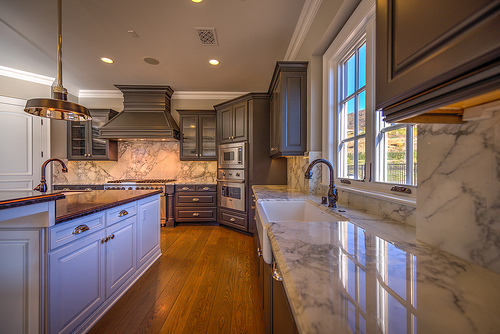 Cambria is 93 percent quartz, a natural stone, while granite can range anywhere from 40 to 60 percent quart, all depending on who you purchase it from. Quartz, being the extremely hard mineral which gives Cambria its durability, homeowners can be assured they are receiving one of the strongest materials on the market. Another key difference is that Cambria is considered to be non-porous, which means it is virtually maintenance free, only needed a simple wash with warm water, while granite is considered to be a porous stone and will need to be treated/sealed annually to keep its shine. Cambria takes the environment seriously, and for that reason, they mine it so that only 70 percent of the material is used in the finished product when in comparison to Granite, only 35 percent of the material is used in the final product. The company, as per its website, states they recycle 100 percent of the water used during the manufacturing process as well. The company will only allow professional contractors who have been certified by their Cambria University to measure and install the product in your home. When asking for a quote, always ask for references and make sure that they are authorized to sell the material. You can confirm or search for a dealer by using the company’s official dealer search tool. Cambria will offer a lifetime limited warranty to the original owners only; the warranty is not transferable. The slab sizes are available in 1cm, 2cm and 3cm thicknesses, with various edge profiles also available to help create the appearance of a thicker slab. No stone will ever be considered 100 percent durable and Cambria is no exception. While it can be considered more resistant, it can be damaged with excessive force, partically near the dishwasher and/or sink area where chips often occur. A minor knife slip, on the other hand, will not cause a ship, but scratch markings, if they do appear, will be more noticeable on a the monotone colors when compared to multi-colored surfaces.